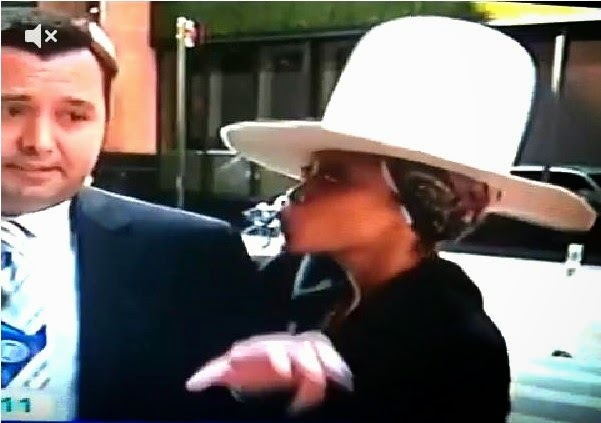 Erykah Badu attempted to kiss her way into a local TV news broadcast on Friday, only to be rebuffed by the reporter. The singer snuck into the shot while New York's Pix 11 reporter Mario Diaz was reporting on Shia LaBeouf's recent arrest for disorderly conduct. Badu edged into the frame wearing a giant white hat and a sneaky grin. After opening her coat to show off her outfit and then making an obscene hand gesture while standing behind Diaz, Badu approached Diaz with outstretched arms and puckered lips. He fended her off with one arm while continuing the broadcast, saying that he "couldn't avoid a fan just now." 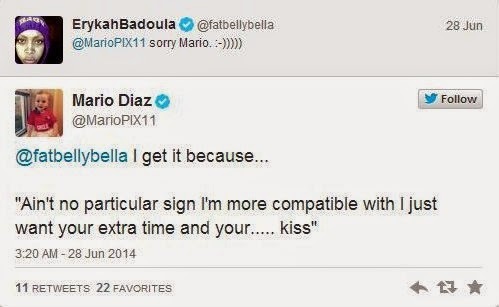 Badu initially denied that it was her in the segment, but later confirmed her appearance with a tweeted apology to Diaz. Diaz responded with some sympathetic Prince lyrics, and then promised, "Next time I won't do the NYC push back." Badu's had a busy New York weekend, even aside from video-bombing local news broadcasts. On Friday night, she performed with Dave Chappelle at Radio City Music Hall, and on Saturday, she performed at a block party in Brooklyn's Bedford-Stuyvesant neighborhood to celebrate the 25th anniversary of Spike Lee's film Do the Right Thing.